Over the last two years more than 200 hobby gardeners took part in a biochar trial coordinated by the Delinat Institute. Different sorts of vegetables were planted on two 10 m² garden plots, the one with compost only and the other with compost and biochar. The analysis of the results showed very interesting differences, once again underlining the importance of specifically applying biochar. In early 2010, the Delinat Institute launched a project in which hobby gardeners were asked to carry out tests with biochar in their gardens. Participants were each provided with 10 kg of biochar taken from the same batch made from green cuttings by the company Swiss Biochar. In addition the gardeners were given detailed instructions on how to apply the biochar as well as a standard questionnaire (in German) for recording their findings. By the end of 2011, 65 individual tests had already been evaluated, with the findings published in the Ithaka Journal (see here). On the basis of the experience gained in the first year of tests the instructions and questionnaires were revised in early 2011 and a further 150 test packages sent out. A number of the previous year’s participants repeated the test, using the revised instructions and the same plot of land. By the end of 2011 the Delinat Institute had received 144 questionnaires from participants. The test findings were evaluated individually and then summarized in a meta-analysis. In the following we will be taking a first look at the results. A detailed analysis and full evaluation of the 2-year project will be published by summer 2012. All test plots had the same size. Part of each plot was treated with organically activated biochar, while the control area was treated only with the organic activation substrate.1 kg of biochar was prepared for each test square metre. The biochar was supposed to be activated before being applied through mixing it in a 1:1 ratio with compost or manure and being kept damp for two weeks. The control area was also covered with the same amount of compost or manure as had been mixed with the biochar. On both test areas the same amount of plants was sown. The harvest was weighed, with – wherever possible – the weight of the unused green biomass (for example the leaves of tomato plants) also being ascertained. Qualitative characteristics such as the taste of the harvested vegetables, their shelf-life and plant health were also to be assessed using a scale ranging from 1 to 10. The difference in the yields relates to the increase or decrease of yields in the biochar sample compared with the non-biochar sample. 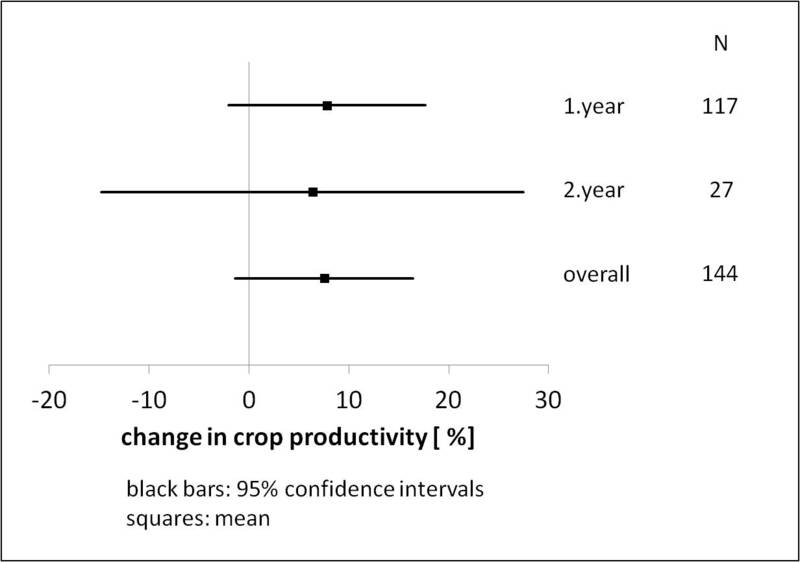 The overall analysis covering all tests shows that in 45% of cases yields from the biochar-treated plots were at least 10% better, in 31% of cases yields were at least 10% worse than non-treated plots and that in 24% of cases there was a difference of less than 10% between the two samples (see Fig. 1). Fig. 1: Overall findings of the 144 tests. The evaluation of all 144 tests shows a wide range of results, even after removing the extremes. In some cases yields were more than twice as high, while similarly there were cases where there was a significant negative impact on yields (Fig. 2). 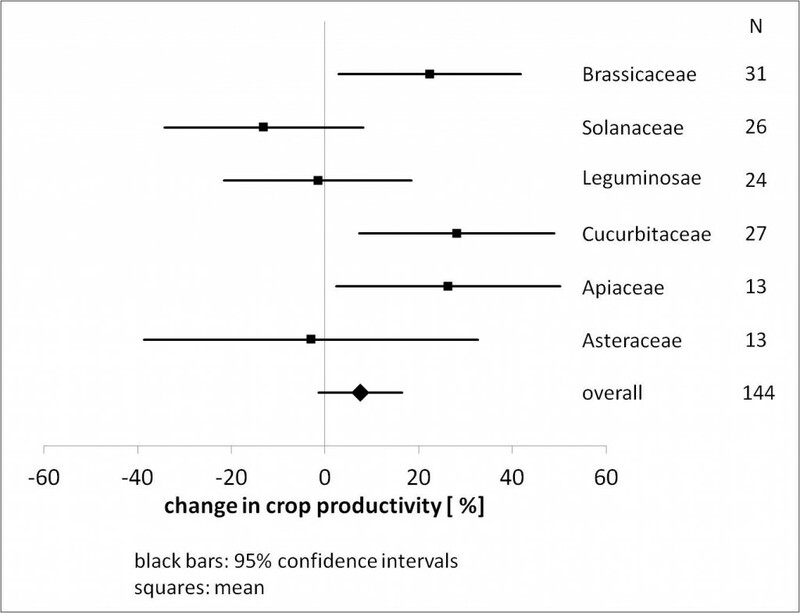 This shows that biochar has a major influence on the interaction between plants and the soil. The better these interactions are understood, the more specifically biochar can be applied. The average for all tests showed a 7.5% improvement in yields (Fig. 2). The comparison between the first and second test year shows no significant difference. What is however surprising is that the range of results in the second year was much wider than in the first year (Fig. 3). A detailed analysis is needed to ascertain the causes. Fig. 4 Increases in yields by plant family compared with the average of all 144 tests. With regard to the qualitative assessments of taste, shelf-life and plant health, slightly positive tendencies were seen, though differences were all below 5% and not statistically significant. You will find a general discussion on the effects of biochar, the test conditions and the expectations from the garden tests in the article “Hobby Gardeners’ Experiments on Biochar: Preliminary Evaluation – in German“. The following discussion deals mainly with the differences in the results in the different plant families. The 7.5% average increase in yields confirms the results of the previous largest meta-analysis carried out by Jeffery in 2011. 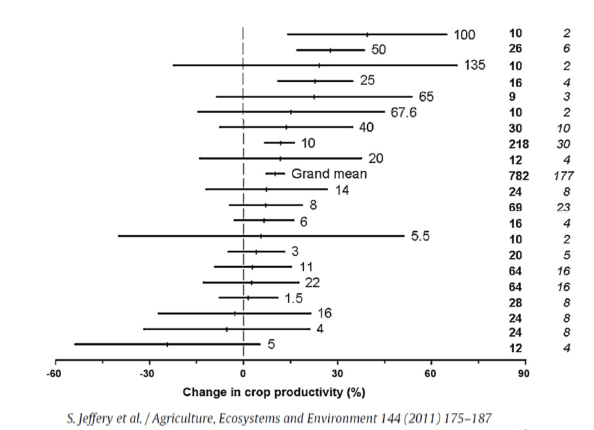 In this Jeffery evaluated 782 published biochar tests, finding that on average yields were 10% better (Fig. 5). Fig. 5: Statistically significant 10% increase in yields through the application of biochar. Meta-study covering 782 tests published worldwide (Jeffery 2011). 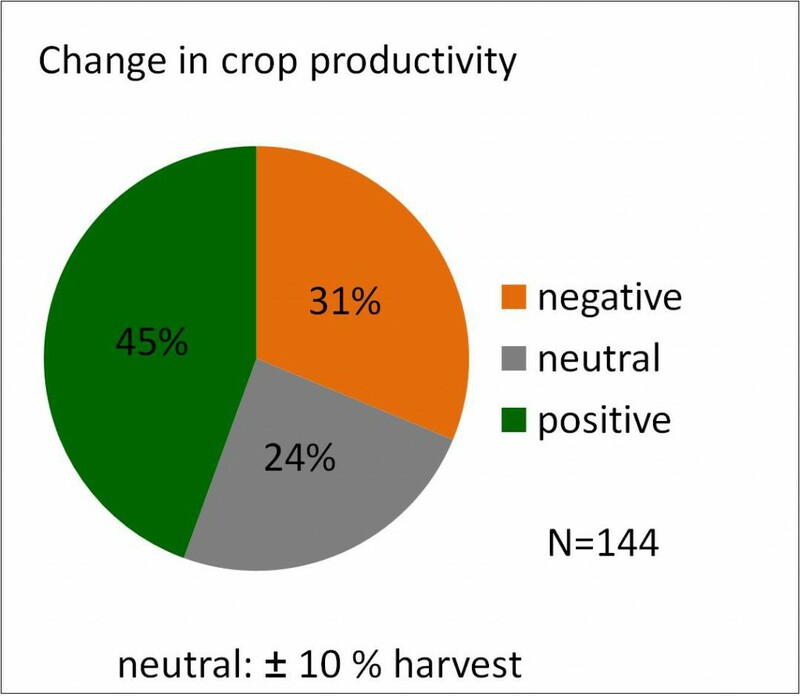 The very positive tendency seen in the effect of biochar on brassicaceae, cucurbitaceae and apiaceae confirms the findings of the first test year. The fact that the different effect of biochar applies not just to various types of plants but also apparently to whole families, is quite understandable, as within a plant family there is a tendency for similar specialisations to be found with regard to certain environmental conditions and metabolism commonalities. There are a number of possible reasons for the different effects biochar has on different plant families. To achieve optimal growth, each family has different requirements regarding its ecosystem. The availability of nutrients represents just one aspect here. Other important aspects include pore volume, soil density, the pH value, the microbial environment, the availability of oxygen, water dynamics and electrical conductivity. The application of biochar has a more or less significant effect on each of these soil properties, influencing a plant’s ecosystem. Dependent on the starting conditions of a soil, any shift in these key soil properties can lead to a positive or negative change in the ecosystem for a certain plant family. This underlines the importance of analyzing the type of soil before applying the biochar, thereby ascertaining its suitability for certain families. For example the application of biochar results in an increase in a soil’s pH value. For plants which do better with a more acid soil – such as strawberries, blueberries or such nightshade plants as potatoes or tomatoes -, the application of biochar will often lead to a worsening of results. On the other hand the application of biochar on acid soils improves the living conditions of such plants as cucumbers and cabbage, plants preferring a more alkaline environment. Similar to the effect on the pH value, the effects of biochar on all other soil aspects referred to above can be ascertained and associated with the requirements of different plant families. Only when this has been done will we be able to plan the specific application of biochar and biochar substrates with a view to obtaining the best yields. Certain effects of biochar, such as increasing a soil’s ability to store water, to provide better aeration or to increase electrical conductivity are deemed positive for all families. These positive aspects can however – at least in the short term – be overweighed by more significant changes in soil-ecosystems, thereby leading to an overall decline in yields. Looking for instance at brassicaceae, one explanation for the positive tendency could be the high potassium requirements found in many types of cabbage. The biochar produced by Swiss Biochar has a relatively high potassium content. The dosage of 10 t biochar for one hectare (1 kg / m²) in the hobby garden tests corresponds to a fertiliser dosage of 80 kg K²O per hectare. Cucurbitaceae also require a lot of potassium, a fact that could also account for them doing well in the short-term framework of the test. In addition both brassicaceae and cucurbitaceae prefer alkaline and well-aerated soils. With their high number of surface roots, cucurbitaceae generally need a lot of water, i.e. yields are high when they are well-watered. As biochar, when superficially worked into the topsoil, has a very positive effect on a upper soil’s water storage properties, the topsoil tends not to dry out so quickly on hot summer days, thereby having a decisive effect on yields. The aim of the upcoming in-depth evaluation of the test findings and their inclusion in Delinat’s long-term field tests is to compile specific recommendations for the application of biochar substrates dependent on soil type and plant family and to better understand the respective interactions. Is the effect of biochar not that significant ? These finding might seem quite disappointing for a number of readers. And for gardeners who have been working very successfully with Terra Preta methods for many years, they might even seem ‘sacrilegious’ – for instance with regard to the bad results achieved in the test with tomatoes which can do exceptionally well on Terra Preta substrates containing biochar, as confirmed last year by both professional gardeners and Delinat tests. The statistical evaluation of 144 tests was expected to lead to relatively reliable average values, even though the individual tests were not carried out under strict scientific conditions and not all factors having an influence on growth were standardised. Although the biochars used in all tests were the same, the soils were different, accounting for the wide range of results. We could therefore conclude that biochar has different effects on different soils. While this is certainly the case, it is not the sole factor explaining the very wide range of findings. It is certainly not just down to luck when in some cases yields doubled through the addition of biochar (Fig. 3). It is therefore all the more rewarding to take a closer look at the extremely positive and the extremely negative results. When certain gardeners achieve particularly good results through the application of biochar, this could possibly be attributable to the efficient way they apply it. The big question-mark hanging over this hobby gardener test is the quality of the organic activation process (see also: “Ways of Making Terra Preta: Biochar Activation“). As a series of scientific experiments have shown [Kammann 2010, Fischer 2012], the quality of the compost plays a decisive role in the biological activation of biochar. The quality of an organically activated biochar substrate is dependent on how well the activation process is controlled. Biochar mixed with rotten cow manure will not do the soil any good, no matter how much biochar is used. And if the compost with which the biochar is mixed has only been turned a couple of times and is full of mould and rot, the biochar might just be able to bind a few toxins, but will definitely not become a substrate working wonders. As nearly all participants used only their own compost, the very great fluctuations in the quality of the compost can probably be seen as the main cause for the wide range of results. In the first year, in many cases the biochar was applied straight, without mixing it with compost, which is probably why the results were more uniform. In a joint action carried out by Delinat and Swiss Biochar in early 2012, 1000 sacks of high-quality biochar substrates (specially developed by the Delinat Institute) were made available for window gardeners. These are the same substrates as the ones used for the Delinat vineyard trial. Even if this action is nothing more than a mass experiment, we hope to gain more results confirming the effectiveness of specially produced Terra Preta substrates with added biochar in (hobby) gardening. The scientific field and plant-pot experiments of the University of Giessen and the Delinat Institute have already been able to show that such Terra Preta substrates achieve better results in six of seven cultures than peat substrates with added fertilisers. The latter results will soon be published in the Ithaka Journal. We would like to use this occasion to thank all participants in what has probably been the most extensive gardening mass test ever carried out in Switzerland. Enthusiasm for biochar and Terra Preta methods show how interested the public at large is in sustainable gardening / agriculture and the careful use of resources. This entry was posted on Saturday, April 21st, 2012 at 11, Apr and is filed under climate-farming.